"There were shepherds living out in the fields nearby, keeping watch over their flocks at night. 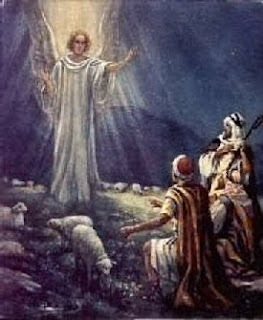 An angel of the Lord appeared to them, and the glory of the Lord shone around them, and they were terrified. But the angel said to them, "Do not be afraid. I bring you good news of great joy that will be for all the people. Today in the town of David a Savior has been born to you; he is Christ the Lord. This will be a sign to you: You will find a baby wrapped in cloths and lying in a manger." 'Glory to God in the highest and on earth peace to men on whom his favor rests.'" The angels said "to you." "TO YOU"? To who? ...Shepherds... dirty, dirty shepherds. Not to kings and rich white folks but to poor shepherds from whom most of their flocks were taken and dedicated, due to decree, to benefit not them but King Herod. This is generally how things went for them. They rarely ate what their own hands had worked for. Micah 4:4 says "Every man will sit under his own vine and under his own fig tree, and no one will make them afraid, for the LORD Almighty has spoken." The Angels said "Fear not!" In the context of oppression those would have been powerful words. The angels said, "to you a savior is born." A savior for them. I am sure they heard lots of "savior" talk in their day, from Caesar and from Herod, but I am sure it hardly ever pertained to them. it was always for someone else. Promises of peace and salvation were made but always to the rich always to the powerful never to shepherds especially Jewish ones. But Angels say "to you." Amazing! "...On Earth Peace..." they loudly sang in the chorus. Peace, peace, peace. This too, to shepherds, would have been popular jargon during the "peace of Rome." But once again, never for them always for someone else. But finally, angels serenade them with "peace." Finally good news for them and not for someone else. Finally good news to "all the people." Surely this is "good news to the poor." Only this would give them courage and the sort of hope it takes to leave Herod's flocks behind and worship the true Messiah, the son of David, the King of Kings, the good shepherd born in a lowly manger. May our Christ-mess celebration be good news to the poor and to all the people, not just to the people who hang stockings to be filled with ipods. Usually stockings, to use a metaphor that you will understand, are like an "appetizer." The main course is still the wrappings. Thus, when you write, "stockings to be filled with ipods," I really wish I could be that family that uses those as stocking stuffers. I know I am totally missing the point of your Christ-mess posts by bringing up ipods again and again, but hey, I'm a materalistic hedonist.